The sail boat with an internal combustion engine (ICE) is a hybrid boat. Primary propulsion is the sail using natural wind power. The ICE is the auxiliary propulsion providing power in confined areas, when there is no wind, and possibly against a wind and or current. For practicality, I will assume that sailors do not normally drive their boats against the current and wind but would likely stay at anchor or in the slip waiting for a more advantageous time to make passage. • Inboard motor – Electric, Gas, Diesel, or Propane. In this paper, my intent is to discuss the characteristics of the inboard systems only. Now let’s look at these options and what they really are. The motors are really two unique systems. The electric is an electro mechanical motor that uses electric current to spin a rotor surrounded by a stator that then directs that rotation to the shaft. There is a battery (power storage system) that holds the stored power which the motor uses. There are controls usually by wire system and communications by wire to the helm monitoring system. Most modern systems use computer supported controllers to manage the motor. The motors are either AC or DC and run on DC low voltage of 12Vdc, 24Vdc, 36Vdc, and 48Vdc or high voltage of 72Vdc, 96Vdc or 120Vdc. 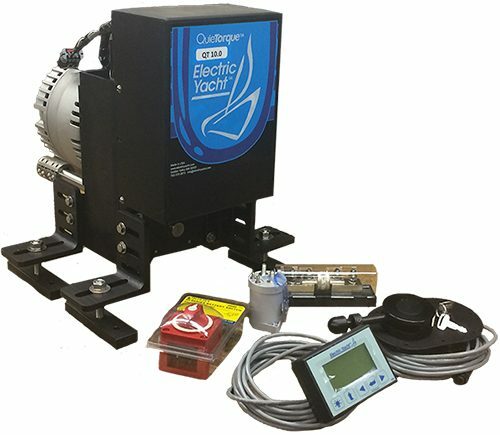 The 48v PMAC motor has become the motor of choice for most new sailboat systems. There is no gear shifting required as propeller rotation is directed by running the motor in either direction. Often there is no cooling system necessary for electric motors. There is a battery storage system that also requires a charging and monitoring system. The ICE is a complex machine with many moving parts. What does that mean to the sailor? If you are a sailor who runs the diesel engine at high throttle and for long periods, you need to stay with diesel. If you are a sailor who considers the auxiliary a “necessary evil” and uses it for shorter intervals, electric is an option. 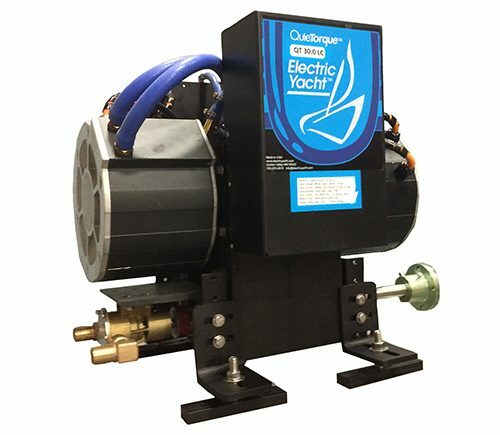 Electric propulsion is ideal for the day sailor. Noise, smell and maintenance are greatly reduced. A typical electric motor system will provide enough range to get home if the wind quits. Normally this is a limited distance and requiring slow speed control. .
For day sailing the advantages of slow speed operations in close shore racing is an advantage to electric. 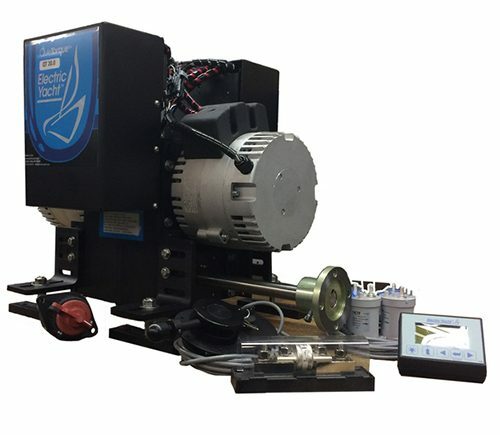 In the environment of close in off shore racing the ability to reduce weight with high tech LiFePO4 batteries and light weight motor is a significant weight reduction over diesel. With the cruiser, wind and sails are the only practical propulsion. There are no fuel stations off shore. Or are there? None for the diesel but wind, solar, and sailing regeneration provide power to the propulsion battery bank and also house needs. The use of the diesel running in idle to provide an additional few knots is not efficient use of power and not good for the diesel as it loads the engine. Finally the diesel alternator as a source of house power is very inefficient. For the cruiser, we do not recommend electric only for major cruising but the electric hybrid solution provides a significant advantage over diesel only. Like day sailing, lake sailors can gain the advantages of electric propulsion without range anxiety. Unless you are on a very large lake you can count on having enough range to get home if the wind quits. Hybrid systems add a diesel powered generator to provide longer range motoring. This is appropriate for larger off shore cruising boats. This type of system operates as an electric system for getting in and out of port and for low speed motor sailing. When more power is needed, the generator can be started. This provides for much longer motoring range. It also provides for efficient battery recharging at sea or at anchor. The energy stored in the propulsion battery is tapped to provide 12Vdc or 24Vdc for house loads.